What’s your Stage Plot / Technical Requirements / Input List? It’s a portable puppet stage with an overall height of 1.8 metres, and an overall length of 2.5 metres. The puppet stage is only a front-on facade (as opposed to a box or a tent). We require about a metre and a half to two metres behind it to lay out the puppets, props, and two performers. It takes 45-60 minutes to set up the puppet stage, props, puppets and sound equipment. 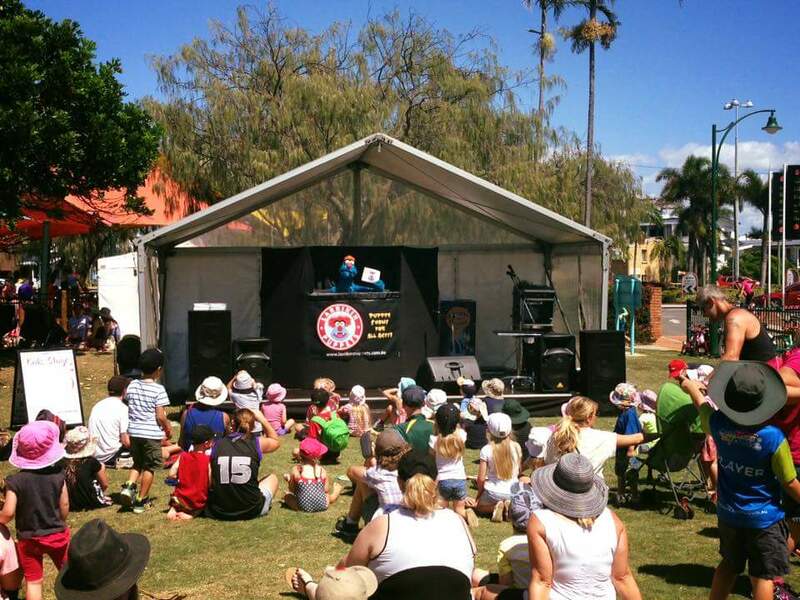 At some events where we are scheduled as a main stage act, we set up the puppet stage at the back, side or behind the main stage, then get a few hands to help us strike on to the main area just before our act is about to commence. It isn’t very heavy to carry, but does require more than one person to lift when it’s all set up. Then we can quickly lay out the puppets and get mic’d up for the performance. If we are set up in one spot for the day (to perform several puppet shows throughout the day), we set it all up – including our two P.A. speakers – before gates open, and then pack down at the end of the festival. A powered site (generator or other) is ideal so we can plug in our P.A. 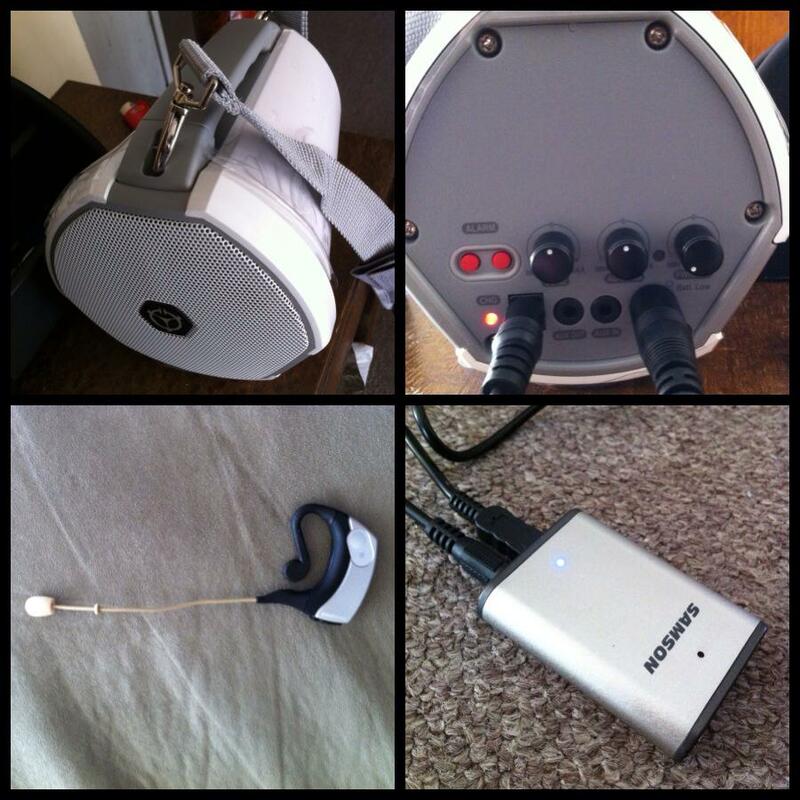 speakers, music/sound effects and two wireless headset mic receivers. We can provide our own P.A. speakers if we’re set up in our own spot at the festival for the day with access to power. We require 1 powerpoint. We plug in an iPod containing music and sound effects (which we start and stop throughout the performance), and headset mics that we wear. We are usually happy just to use this equipment. 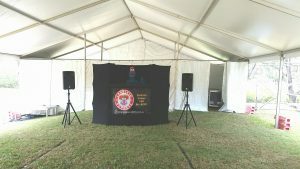 However, events with a much bigger stage and larger audience usually provide us with the means to plug our two headset mic receivers and the iPod into their mixing desk so that our show can be projected via their main P.A. We still need to be able to control the iPod from behind the puppet stage throughout the show, though. Some events place a D.I. box (direct input) close to us to plug the iPod into. 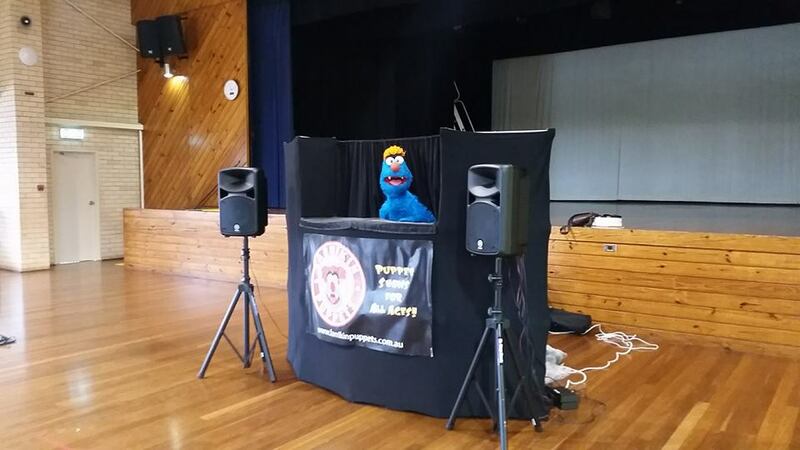 Other events have very long cables stretching from the mixing desk to the puppet stage. Many festival events provide us with their headset mics. We require two. We supply music for our act, coming through an iPod/iPhone 4, which we start and stop throughout the performance. We do not require a sound check unless we’re to be amplified through the event’s main P.A. system. If it’s just through our own P.A. speakers, we can do our own sound check. Whilst performing, we cannot see if a child is approaching the stage, the puppets or other equipment. We ask that young audiences are supervised by at least one adult at all times for the duration of the performance, and during the set up and pack down. A bit of crowd control is good, as the kids can get rowdy and excited when unsupervised. We also ask that paints, scissors, crayons, pens and pencils aren’t being used by the kids close to where the puppet stage is. 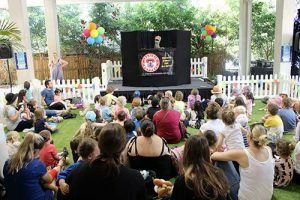 Kids sometimes like to throw lolly wrappers, cupcakes, toys, stones or icecream at the puppet show. Please supervise to prevent any damage to equipment or injury to performers. Our public liability insurance is through Duck For Cover Entertainers’ Group, Inc. The only company in Australia willing cover this style of act. We require only one car park for this act.